Summary: Trueblood was upset with his former girlfriend, Susan Bowsher, because she expressed her intention of going back with her ex-husband. Trueblood picked up Susan and her two small children one day and while they were in the car he shot Susan 3 times in the head, and shot each child once in the head. He then drove to the home of his twin brother, admitted to him what he had done, borrowed a shovel, then drove to a secluded area and buried all three in a shallow grave. After 4 witnesses had testified at trial, Trueblood indicated a desire to plead guilty and did so. When interviewed by the Probation Officer for the Presentence Report, Trueblood claimed that Susan had shot the kids, then killed herself. He then sought to withdraw his guilty plea, which was denied. Shepard Opinion; Debruler, Givan, Dickson, Krahulik concur. PCR Petition filed 05-09-94. PCR denied 08-12-96 by Special Judge Thomas K. Milligan. Affirmed 5-0; Boehm Opinion; Shepard, Dickson, Sullivan, Selby concur. Petition for Writ of Habeas Corpus filed 08-28-00 in U.S. District Court, Northern District of Indiana. Writ granted 11-07-02 by U.S. District Court Judge Allen Sharp. Trueblood v. Anderson, 156 F.Supp.2d 1056 (N.D. Ind. July 30, 2001). Trueblood v. Davis, 301 F.3d 784 (7th Cir. August 20, 2002). Opinion by Circuit Judge Richard A. Posner, Judge Kenneth F. Ripple, Judge Terrance T. Evans. Trueblood v. Davis, 123 S.Ct. 1650 (March 31, 2003) (Cert. denied). Trueblood v. Indiana Parole Bd., 123 S.Ct. 2295 (June 12, 2003) (Application for stay denied). Trueblood v. Indiana, 123 S.Ct. 2295 (June 10, 2003) (Application for stay denied). Trueblood v. State, 790 N.E.2d 97 (Ind. June 12, 2003). Denied 5-0; Opinion by Shepard; Dickson, Sullivan Boehm, Rucker concur. TRUEBLOOD WAS EXECUTED BY LETHAL INJECTION 06-13-03 12:24 AM EST. 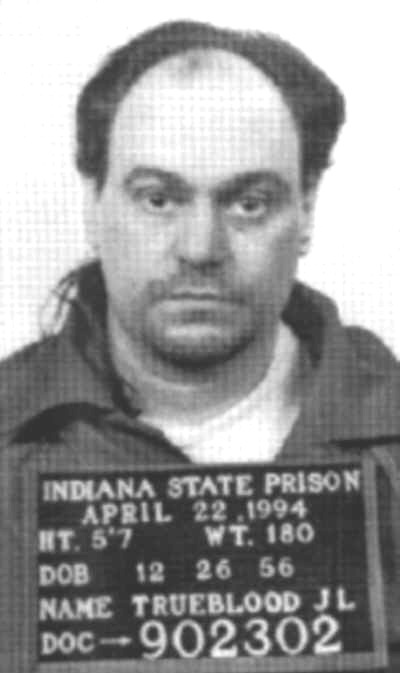 HE WAS THE 81ST CONVICTED MURDERER EXECUTED IN INDIANA SINCE 1900, AND THE 11TH SINCE THE DEATH PENALTY WAS REINSTATED IN 1977.